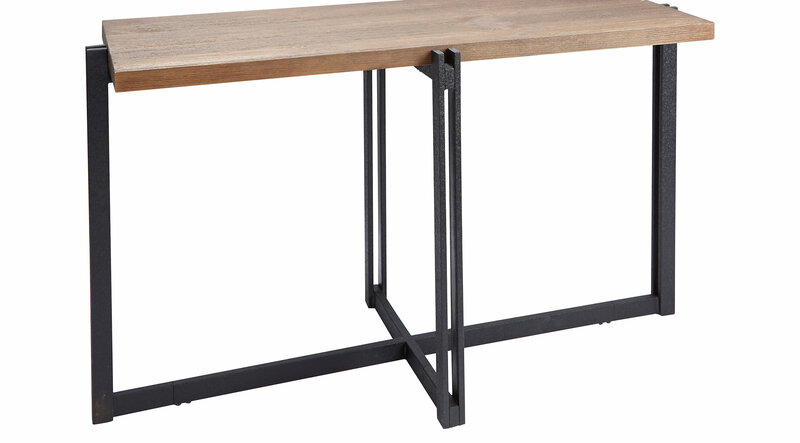 Add the Davinwood console table with wood top to your living room or entry way for a stylish, well-designed focal point. Whether you dress it up for the holidays, with a pair of stylish table lamps, or just a bowl for your keys, this beautiful table is sure to enhance the look and elevate your space. The double square sled base creates a sturdy cross-frame and features a unique crackled finish, adding stability and style. Pine wood veneer with a natural wood grain texture gives this item a slightly rustic flair, which adds a unique mixed material appeal when combined with the distinctly industrial, modern metal base.